Our grassroots nonprofit organization was founded in 1984 by Cheri Loveless, Linda Burton and Janet Dittmar and originally named Mothers at Home. In 2002, the Board of Directors changed the organization's name to Family and Home Network. Based in northern Virginia, Mothers at Home was “devoted to the support of mothers who choose (or would like to choose) to stay home to nurture their families.” Its goals were: “to help mothers at home realize they have made a great choice; to help mothers excel at a job for which no one feels fully prepared; and to correct society’s many misconceptions about mothering.” At that time, prevailing messages to women were that they could (and should) “do it all” and that success and self-worth were to be measured by academic and workplace achievements. Media reports depicted working mothers as the epitome of the modern, enlightened women; in comparison, at-home mothers were referred to with demeaning stereotypes drawn from 1950s-era television sitcoms (i.e. June Cleaver or Ozzie and Harriet). For more than three decades, we've been listening to the thoughts and feelings of tens of thousands of parents. We published our monthly journal, Welcome Home, from 1984-2006. We've also been publishing books and policy papers, speaking up on behalf of at-home parents to media representatives and legislators, and offering workshops for new parents. We've learned to use new technology to communicate with parents. We keep our focus on the basic human need for nurturing relationships. We follow the multi-disciplinary research on developmental science, which offers a mountain of evidence demonstrating the critical importance of nurturing and intimate, two-way relationships between parent and child. The timeline below is a work in progress. The founders initially focused on a monthly publication for at-home mothers: Welcome Home. Every month, another 32-page, advertisement-free issue of Welcome Home went out in the mail. Readership grew primarily by word of mouth. Written, edited and illustrated by parents, for parents, Welcome Home included personal essays, poems, letters from readers, a monthly “problems and solutions” column, artwork and photographs. In addition, there were informational articles on a range of topics, book reviews, Media on Mothers columns (examples of positive and negative media reports), Public Policy analyses and opinion on cultural issues including consumerism and advertising. Winner of several prestigious Parents' Choice Awards for Excellence in Parenting Publications, Welcome Home brought a sense of community to each subscriber's mailbox. Imagine the time before the internet... when at-home parents had few ways to connect with each other. You can find some of our favorite essays from Welcome Home published here on our website. Most of the work of publishing Welcome Home was accomplished by volunteers. But like many publishers, we struggled to meet rapidly rising costs of printing and mailing. Subscription levels dipped with the availability of blogs and websites (including our own). In 2004, after 220 issues, we suspended publication and closed our office. In April 1984 the founders testified at a Congressional Hearing about what they were hearing from mothers: the call for family policies that offered true choices – not just more child care, but also more economic and social support for mothers who wanted to care for their children themselves. What's a Smart Woman Like YOU Doing at Home? Mothers sent letters and essays to Welcome Home. Stunned by their candor, passion, and insight, Cheri, Linda and Janet set out to do some research and write a book, They were hearing from Republican mothers, Democratic mothers, well-to-do mothers, just-getting-by mothers, those of many different religions and those of no religious beliefs. The title quotes a publisher’s reaction when one of the authors approached to talk about their book—and he turned down the book, saying that no one wanted to read about at-home mothers. What's a Smart Woman Like You Doing at Home? includes essays by the co-founders, excerpts from Welcome Home readers’ letters, a report on the widespread and blatant misuse of U.S. Department of Labor statistics on “working mothers” and excerpts from their Congressional testimony. Acropolis Books published the first edition; Mothers at Home published an updated 1992 edition and the third edition in 1996. In 1989 Mothers at Home co-founder Cheri Loveless led a year-long effort to produce a concept paper: Mothers Speak Out on Child Care (MSOOCC). This paper examined some common misconceptions about mothers and work, about the media’s portrayal of issues of mothering issues, and about policy options. It included an explanation of the way statistics on mothers and employment are often misused—a point the organization continues to make today. Most importantly, MSOOCC gave voice to mothers whose stories were not being heard by policymakers. We mailed copies of MSOOCC to leaders of other mothering organizations, to professionals and members of the media—asking for feedback and endorsement. Our team of volunteers, mothers with children in tow, delivered MSOOCC to every Congressional office. We spoke out in opposition to the media-devised “Mommy Wars,” and called for recognition of the many creative ways mothers and fathers care for their children, as well as recognition that today’s “working mother” or “working father” might next year be “at home” and visa versa. Over the years, representatives of MAH/FAHN have testified several times at Congressional Hearings, and we’ve attended countless policy briefings, symposiums and conferences at Washington DC think tanks. Our advocacy work is nonpartisan. In 1990, when one-fourth of Wellesley’s students signed a petition in protest of Barbara Bush’s appearance as their graduation speaker because she had been “just” a wife and mother, MAH wrote a thank you letter to the first lady for her eloquent and educational speech. In 1992, when there was public outcry over Hillary Clinton’s “I could have stayed home and baked cookies” comment, MAH wrote an editorial in support of her, noting that her comment were made in the context of our culture’s stereotypes and misconceptions about motherhood. At a time when "family-friendly" workplaces were being touted for the services they provided that enabled parents to focus on work while others cared for their children, Mothers at Home made different choices. We were running an operation with an annual budget of about $350,000 (mostly subscription revenue and costs associated with publishing and mailing our monthly journal Welcome Home). There was a lot of work to be done, and we designed a space and policies that worked for us. When the organization moved to a new office, it had sliding glass doors installed on opposite sides of a middle room, creating a play room with access to the administrative office and the conference room so that mothers could work and keep an eye on their children at play, and children could have ready access to their mothers. Staff positions were part-time, paid jobs, ranging from four hours per week to fifteen hours per week (and staff members often contributed additional volunteer hours). Procedures were designed to meet the needs of the part-time staff. Priorities included flexible hours and a welcoming office space for children. At one particularly memorable Board and staff meeting, there were seven toddlers moving between the playroom and their mothers' laps. For the next meeting, we found a playroom helper! 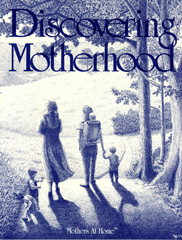 Our book for women in their first years of motherhood came out in 1992 - Discovering Motherhood. Edited by Pam Goresh, Heidi Brennan and Catherine Myers, it included personal narratives, essays, informative articles, humor, and poetry by more than forty authors. Discovering Motherhood explores the realities and rewards of a home-centered life in 80 pages, in these five sections: Redefining Ourselves * Choosing Home * Taking Care of Ourselves * Living With Changes * Growing in Unexpected Ways. We celebrated the organization’s 10th anniversary with a family picnic and a year-long series of profile articles about the organization’s staff and volunteers. Speaking up against the "Mommy Wars"
At the beginning of 1997, Working Mother magazine named the "25 Most Influential Working Mothers" and the magazine's editors, along with the 25 honorees, were invited to a White House luncheon to celebrate with First Lady Hillary Clinton. Unfortunately, both in print and in media interviews (on the Today show and elsewhere) the editors decided to celebrate working mothers by denigrating the lives of mothers who choose to be at home. They not only perpetuated negative stereotypes about at-home mothers but embroidered these stereotypes outrageously. Many Welcome Home subscribers wrote to us, dismayed by this nonsense. Most of the time, we ignored this all-too-prevelant "Mommy Wars" media sensationalism. But, Working Mother had access to media (including regular monthly guest appearances on the Today show) as well as access to influential policy-makers. Taking on extra unpaid hours, our media and policy team members went to work. We wrote letters to Working Mother magazine's advertisers and we wrote a letter the celebrated "25" working mothers. We heard back from several of the honorees, and from several major advertisers. And then, the Editor of Working Mother magazine called to apologize. Evidently, we made our point. Read our Letter to Working Mother's 25 Most Influential Mothers. Tracy Thompson's thoughtful take on the "Mommy Wars"
Washington Post reporter Tracy Thompson wrote thoughtfully about her own experience as well as others' experiences. And - unlike many media representatives - she reported accurately on the use of statistics about mothers and work. Our Public Relations Director, Marian Gormley, spent a lot of time talking with Ms. Thompson, and she is quoted in the article. Read the article here: "A War Inside Your Head"
On the topic of affordability, we were hearing a lot of misconceptions from reporters and policy makers. We knew that many families lived on moderate incomes, that many made significant sacrifices and/or did a lot of financial planning to make it possible to have a parent at home. And we knew that it was incorrect to simply divide mothers into two categories: at work or at home. In order to collect data and recruit families willing to talk with reporters and policy makers, Marian Gormley (PR/Marketing Director) and Heidi Brennan (Public Policy Director) designed an in-depth survey on family finances and recruited participants through a notice in Welcome Home. Over 100 families completed the survey, sharing details of their family finances as well as their thoughts and feelings about the choices they’d made. We reported on findings in Welcome Home and were able to refer reporters to families across the U.S. who, in spite of modest incomes, managed to have a parent at home: Affordability Project. When Harvard University’s Center for Health Communications released a report on parenting teens, Welcome Home reported on the study and its editors sought out brief narratives from parents as examples of each of the five “basics” identified by the researchers: Raising Teens. Over the years, Mothers at Home had been reaching out to at-home fathers and also acknowledging the interdependent partnership between at-home parents and their income-earning spouses. While maintaining its special focus on at-home mothers and fathers, the organization was expanding its outreach and emphasizing that parents themselves had to decide how to share and/or divide the income-earning and caregiving responsibilities. Parents must become informed about the critical importance of nurturing relationships and about the generous amounts of time needed to build those relationships with their children. We spoke out in opposition to the media-devised “Mommy Wars,” and called for recognition of the many creative ways mothers and fathers care for their children, as well as recognition that today’s “working mother” or “working father” might next year be “at home” and vice versa. After much discussion and an often-frustrating search for a new name, in 2002 the Board of Directors changed the organization’s name to Family and Home Network. FAHN'a Heidi Brennan and Catherine Myers approached the federal Child Care Bureau to suggest that rather than ignoring parents who chose to care for their own children, they could offer information about this option. FAHN was invited to present a handout - Wholehearted Family Policies - and poster at the 2004 State Administrators Annual Meeting. 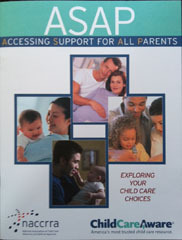 We also drafted a publication - Accessing Support for All Parents, a guide for parents exploring their child care choices (NACCRRA and Child Care Aware, published 2006, online 2015). This project marked the first time the Child Care Bureau addressed the choice of having a parent forgo or cut back on paid employment to provide care, and the first time it offered resources to at-home parents. In 2003 FAHN launched its Campaign for Inclusive Family Policies—calling on policymakers to craft policies that support families regardless of the ways in which parents share and/or divide their income-earning and caregiving responsibilities. Issues that impact families are complex—tax policies, child-care subsidies, work and family policies—and we work to ensure that policy makers and the media understand the range of choices families make in caring for their children. Like most publishers of magazines and newspapers FAHN was struggling to respond to the challenges of the internet. The exorbitant cost of office space in the suburbs of Washington, D.C. was a serious strain; moving to a less expensive space in a renovated basement, our office flooded repeatedly. We tightened our budget year after year, eliminating the marketing that might have increased subscription numbers. Finally in 2004 we decided to suspend publication of Welcome Home and close our office. We continue our work via our website and social media tools. Catherine Myers, FAHN's volunteer executive director, wrote a guest blog post for New America's Asset Building blog. Equality and Justice for All Families critiques family policy discussions that focus narrowly on parents in the workplace and ignore families who care for their children by cutting back or forgoing paid employment. It is a call for inclusion, equality and justice - in accordance with FAHN's Campaign for Inclusive Family Policies and aligning with the recommendations of New America's own scholars. Our new website launched in Fall 2018! With the basics in place, we'll continue to add content and learn more about using available features. If you're interested in helping, let us know! Thank you to Drutopia for inviting us to be among the first to build using this platform! Our new membership community is here! Meet other parents devoted to spending generous amounts of time with their children, join a discussion, start a discussion, ask questions, learn about the organization's efforts - and join one (or more) of our volunteer teams. A confirmation email will give you the link to our online community, where you can choose a user name, tell us as little or as much as you'd like to about yourself, look around and find (or make) a group. We're just getting started there, so please put your leadership skills to work and dive right in. Think about what you'd like from an online community, and help shape Family and Home Community.